Franklin Graham wrote this op-ed piece which ran on USAToday.com on February 21, 2018. My father never gave up on me, even when I caused him pain. He lived like the Gospel he preached—a message he repeated till his last breath. In the summer of 2005, he preached his final series of public messages to more than a quarter of a million people in New York City over three days. It would be his final live evangelistic crusade. That same year, a Gallup poll revealed that one in six American adults—35 million—had heard Billy Graham preach in person. Since 1947, some 215 million people at more than 400 crusades, simulcasts and evangelistic rallies heard my father tell them, “The Bible says, ‘For God so loved the world that He gave his only Son, that whosoever believes in Him will not perish but have eternal life’” (John 3:16). Today, he is experiencing what he devoted a lifetime to telling others they could experience if they placed their trust in Jesus Christ. During that final crusade in New York, he spoke with a national magazine about death. “Do I fear death? No. I look forward to death, with great anticipation. I am looking forward to seeing God face to face. And that could happen any day” (Newsweek, July 4, 2005). Well, that day has come, and while I miss him (and my mother) dearly, I take great comfort in knowing I will see him again. 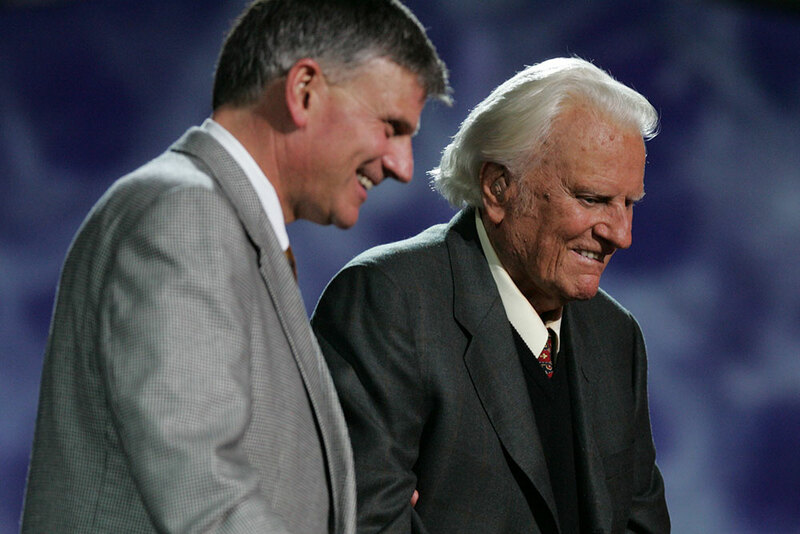 The man the world knew as Billy Graham was always “Daddy” to me. I was well into my teens before I fully comprehended that my father had a household name and a worldwide ministry. He was home a few days, then gone for weeks—sometimes months. Had it not been for my mother’s cheerful attitude and spiritual strength, his absence may have had a devastating impact on me. Her eyes flickered like the flames in the fireplace as she described Daddy’s travels, crusade meetings and people he met from all walks of life. His homecomings were always a big deal. We waited eagerly at train stations and airports watching for his long legs to step onto the railway platform or airport tarmac. Other times, we ran to the driveway when we would hear the car coming up the mountain. My three sisters, brother and I would tackle him, but he always managed to scoop us up into his loving arms, letting us know how much he had missed us. Then, he would turn his attention and affection to the woman he loved—and who shared her life with him for 64 years. Those were happy times. On most Sundays for the past 20 years, I have driven an hour-and-a-half to have lunch and spend the afternoon with my father. I’ll forever cherish these special times we spent together. But there was a time when our relationship wasn’t so good, a time when I caused my mother and father quite a bit of anguish and heartache. During my teens and early 20s, I proved to be anything but what most people expected Billy Graham’s son to be. I’m so thankful he never gave up on me or quit loving me. With my mind racing, wondering what he was going to say next, I heard these words: “I want you to know we’re proud of you, Franklin. We love you no matter what you do in life and no matter where you go. But you’re going to have to make a choice.” He had pricked my conscience to the point I was actually angry. I couldn’t figure out how he knew about the struggle that had been going on inside me—but he did, and he was right. My father’s words haunted me for several weeks until I finally gave up running from God and made that choice to accept Jesus Christ as my personal Savior and turn my life over to Him. I’ve never looked back or regretted my decision. About 20 years after our life-changing walk along Lake Geneva, my father told me something else that would alter my life in another way; he asked me to assume the day-to-day management responsibility of the organization that bears his name. I’m at least smart enough to know I could never fill Billy Graham’s shoes, but I’m grateful he gave me an opportunity to help him finish his race on earth well, and to continue his life’s work. Billy Graham’s message of the cross never changed since he preached it at his first crusade—to an audience of 6,000 at the Civic Auditorium in Grand Rapids, Mich., in 1947. Many books have been written by my father and about him. For more than six decades, authors, reporters, scholars and observers have scrutinized his life and commented on it for the public record. But the purpose of Billy Graham’s life is captured in a single paragraph found at the end of a little book a number of years ago. If my father could speak or write to us today, he would say the same thing. It was what he lived and breathed—until his very last breath. Franklin Graham, the son of Billy Graham, is the president of the Billy Graham Evangelistic Association and Samaritan’s Purse. Your father was a wonderful man, the people he brought to Christ, were saved is the most wonderful thing. I believe in Christ, i’m Thankful, praise God that my home well be in heaven one day. Thank you for these honest and inspiring words. Mr. Graham sure was, and always will be a great inspiration to my spiritual life. I loved the picture of him sitting on his rocker outside his country home. I always wondered what he thought about while sitting there. I read a devotional from him everyday and of course I “hear” him reading it. Even though he is not here physically, I can still hear him preach the gospel. My continued prayers for his family. Not of sorrow because we all know that Mr. Graham is where he preached he would be one day. God Bless !! Your father’s sermons have touched me deeply and have turned me back to Christ! His explanation of God’s word is at its simplest form but makes the greatest impact! You could always see the joy and peace that radiated inside of him because of Christ! Let’s rejoice in knowing that he is with his loving savior and with your mother! God bless you and your family! Thank-you for continuing to share your Father with the world. My Christian walk has always been encouraged by Billy Graham’s life and even in his death he continues to point the world to our sweet Savior Jesus. What a great man of God, I had the blessed privalage of attending a Billy Graham Crusade in Durban, South Africa. I was so inspied by his message, he impacted my life forever. I have never forgotten that afternoon. I accepted Jesus as my Lord and Savior in July 1977 the greatest and most important decision I have ever made. As I approach a new decade turning 80 in August, I look forward to spending eternity in Heaven, which will be my final address. Praise God for His love, promises, faithfulness, and kindness. Today, 29th March 2018 is the anniversary of my late husband Craig who went to be with the Lord 16 years ago. He passed away pre dawn and awoke in the glorious presence of God’s Kingdom, his forever home. Friend(s), do you know that you will outlive the sun? When all your work on earth is done what will people remember you for. Oh that you may giver a deeper thought to this all important question and re-consider where you will spend your life hereafter.